I mean to write an In My Mailbox post last week but of course, I didn’t because I was just lazy to do so. I did buy some books last week, but I’ve been sort of good because I didn’t buy much. I did succumb to retail therapy, though, because I had a very bad Friday last week. Fridays aren’t supposed to be bad, so when you have a bad Friday, you just have to cope up, and my way of coping is of course, through books. 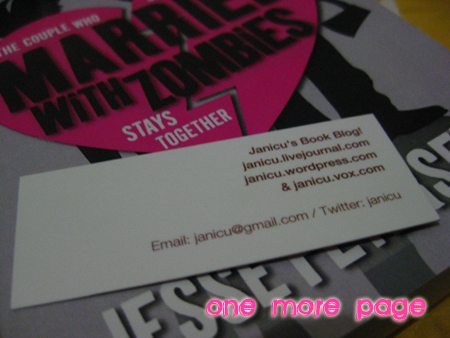 ;) Then this week, I actually received something in my mailbox, so it’s high time to write something about it. In My Mailbox is a weekly book meme hosted by Kristi from The Story Siren, where bloggers post about what books received that week, be it via mailbox, library or store. And here we go with this week’s (and last week’s) stash! Paper Towns by John Green (Fully Booked) – I was having a bad Friday, yes? I saw this in Fully Booked and got it to appease my mood. That, and I know it’s a good book, and last because it’s hard to find this book here. :P I’ll read this soon, promise. Have a great Sunday, everyone. :) To my fellow Filipinos, stay safe! They’re not exactly goodies, but just awesome drawing of zombies inside. :D I kind of wish this book was mine (but don’t worry, Aaron, I’ll give it to you :P). I don’t often wear heels this high, but I like this one. I can’t walk in them for hours, but they make my legs look nice. Yay. You should see the photo of the author when you get the hardbound book. :) Awesomeness. Yes, Fridays aren’t supposed to be bad. Thank goodness the following week made up for it. :) Thanks for visiting! Aww Janice is so nice, she sent you a book! :) Looking forward to seeing your reviews of all of the books in your pile this week. Also, I love Charles & Keith! That’s where I buy my purses and shoes. 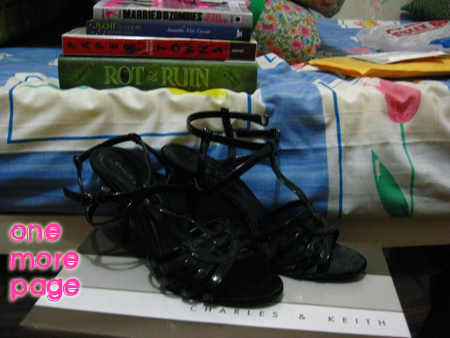 Although with the last wedding that I attended, I got my shoes from VNC instead of Charles & Keith. Paper Towns. Paper Towns. Paper Towns. Paper Towns. Gawd, I love that book, Paper Towns! 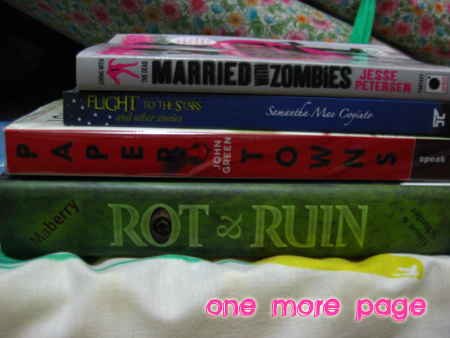 If I could just marry a book, I’ll marry it, Paper Towns! Read it soon. I’m pretty much excited to hear what you think. And there’s Rot and Ruin! YAY! !